Figure 2a below shows 21 Reference Colors for the Standard sRGB / Rec.709 Color Gamut as White, Gray, and Black circles. The 10 Black circles are the 100 percent fully saturated colors on the periphery of the Gamut triangle. The 10 Gray circles are the 50 percent saturated colors that are exactly midway between the White Point and the 100 percent saturated colors on the periphery. The White circle is the White Point with zero percent color saturation. 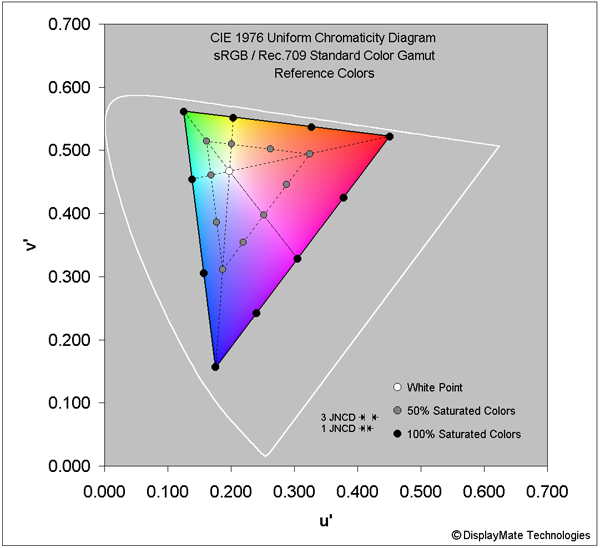 Figure 2b below shows the measured on-screen colors for the 21 Reference Colors as displayed on the Kindle Fire HDX 7 and new Nexus 7. 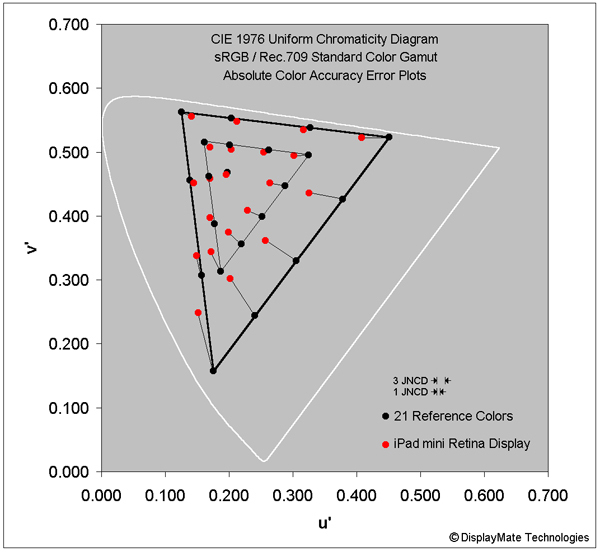 Figure 2c below shows the measured on-screen colors just for the iPad mini with Retina Display, which is included separately because of its very large errors within the plot. Thin black lines pair up the more distant Reference Colors and measured colors. The Reference Colors are all shown as Black circles amd the measured Chromaticities for the Tablets are shown as Red and Blue circles. Color Errors smaller than the appropriate JNCD are not visually noticeable. The 1 JNCD and 3 JNCD are discussed next and appear in both Figures 2a and 2b. The on-screen colors produced by any display can be measured using a Spectroradiometer together with our DisplayMate Test Patterns. 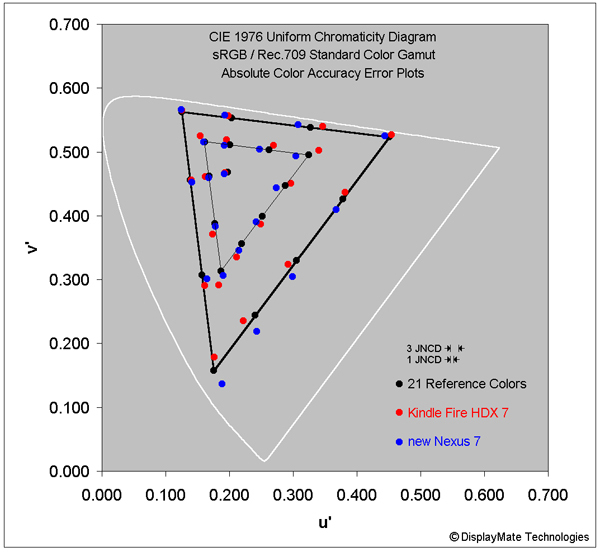 The accuracy of the colors can then be calculated using the 1976 CIE Uniform Chromaticity color space and compared to the eye's sensitivity to color. We present the color accuracy and errors here in terms of MPCD Minimum Perceptible Color Difference or JNCD Just Noticeable Color Difference, where 1 MPCD = 1 JNCD = Δ(u'v') = 0.0040 on the CIE 1976 Uniform Chromaticity Scale. Color differences less than 1 JNCD are visually indistinguishable, while values greater than 1 JNCD are visually noticeable when the two colors are touching on-screen. When the colors are not touching and are further apart, the visual threshold for Just Noticing a Color Difference is higher. Here we will use 3 JNCD for the threshold of a visually noticeable display color difference. Any Color Accuracy or Color Error less than 3 JNCD is visually indistinguishable. The sizes of 1 JNCD and 3 JNCD are shown in Figures 2a and 2b below. Copyright © 1990-2013 by DisplayMate® Technologies Corporation. All Rights Reserved.